The Web Designing & Development Industry is growing at a rapid pace that current technologies are rolled out with each passing day. Many jaw-dropping websites exist on the web. So, in the year 2019, various updates have come in, which makes the web design and development a daunting as well as an enjoyable task at the same time. A stunning website helps in taking your brand to the next level by reaching a new customer segment out. New technology trends that hit the web design & development industry also helps web developers and designers to create intuitive and compelling websites. It is also essential to have a responsive website because the usage of the internet via mobile phones is increasing. The upgrades that are coming in the web design & development sector also leads to enhancing the website’s performance, speed and various other factors that attract visitors to a website. 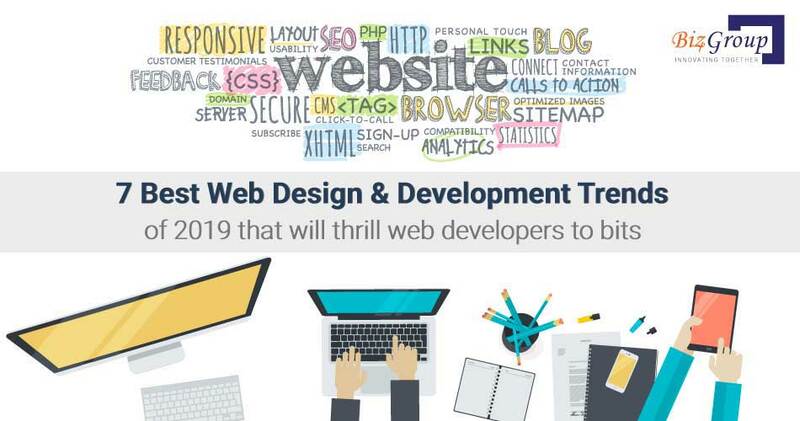 In this post, I will tell you about the best web design & development trends of 2019 every web development company must keep into consideration for creating websites. This web development trend is exciting because it aims at reducing the valuable time of web developers in creating the websites. It reduces the cost and time of Website Development. These kinds of websites are best for enhancing the conversion rates of your customers at the speed of light. Furthermore, mobile-first is the latest trend to consider for growing your business, and single page websites work wonders on smartphones which in turn provides all the essential information about the business to a visitor just on a single page of the website. The icing on the cake is that single page application also upsurges the performance of websites and lessens the unnecessary disturbance that arises because of page reloading. Another stunning web development trends to watch out in 2019 is the AI and chatbots because these are exceptionally clever and competent. With this web design trend, it would not be wrong to say that the majority of customer communication will seamlessly take place with no human intervention in the upcoming years. Business owners can decrease much of their expenditure with the usage of bots, which gradually decreases human involvement. This web development trend is increasing because numerous customers opt for communicating a company by using the live chat feature. Another factor that plays an important role to attract a Google visitor to a website is the advanced typography. There was a usage of Arial font in the past, which is going out of style now. Web developers and designers are maximising the use of typography for websites because it appeals to Google visitor at the blink of an eye. When used efficiently in the logos and headings on the website, it augments the visitors to your website. This web design trend eventually delights visitors to a website. Motion UI is also the latest web development trend that will make web developers grin from ear to ear. With the inclusion of fascinating motion UI components in a website, the user interaction increases at warp speed. The best part about this trend is that web developers have an assorted range of customisation to single out for the website. This trend helps the website developers and designers to modify all the components on a website. It also enables web developers to try hands-on multifarious animation options for a website. This feature can involve elegant headers, animated charts, etc. With the whopping number of websites increase in this connected world, static and straightforward websites will be getting to the top in 2019. This trend is focused by numerous web development companies worldwide. The benefit of keeping the website's static is that they load faster, which eventually enhances the user experience and this is the primary goal for every website. Web developers have the best alternative of using static website generators for creating classy websites that includes plain texts, and these are kept in files. It eventually enhances the page load speed that plays an essential role in increasing website traffic via Search Engines. With the adoption of Progressive Web Apps, the task of web developers will be as easy as falling off a log. These are nothing but the web applications that are shown to users just like a high functionality mobile app, but they are generally nothing but a mobile version of the webpage itself. They can load faster which in turn gives the best browsing experience to Google users. Web developers are focussed on the webpage content for developing a progressive web app. The best part of choosing this web development trend is because it provides a user-friendly experience. The user does not have to install a particular app in this regard. Another web development trend that will rule 2019 is the push notifications. This helps in reaching out to a wider audience and reaps the advantages of digital marketing efficiently. This feature helps you to tell your customers about awesome discounts, and sales promotions, etc. It also helps in appealing the Google user and customers in the blink of an eye. Websites having awe-inspiring and catchy push notifications will also make a user stay on the website for a long time and thereby it improves website traffic to a lot of extents. It is nothing but a form of a pop-up that appears on website for the visitors. Well, the aforementioned 7 web design & development trends are sure to take the web development segment by storm in the year 2019. So, are you all set to roll out a brand new website of your business? If, yes, feel free to contact us and our team of cool developers will help you to get the smashing website developed that will fetch you decent traffic, and fascinate visitors to your website in a wink.